US equities have been quite resilient in the face of this global retrenchment. Here are two comparisons that indicate that while the US market is not isolated from the global turmoil, it is certainly less vulnerable. 1. 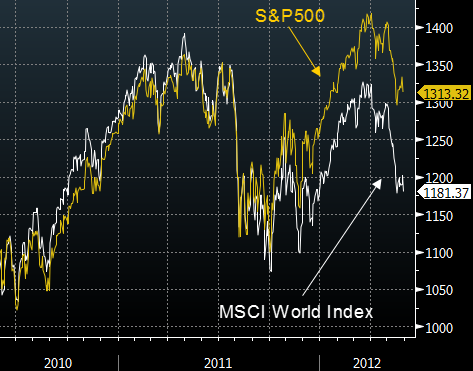 The S&P500 vs. the MSCI World index (US vs. global equities). 2. 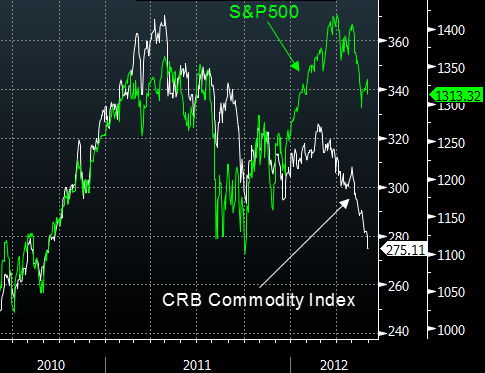 The S&P500 vs. the CRB Commodities Index. Commodities tend to reflect demand driven by global economic growth (recently dominated by emerging markets). It remains to be seen whether this outperformance persists going forward. But for now large cap US stocks have been a de facto "safe-haven" in the global markets.